Many people who migrated from Myanmar to Taiwan in the early postwar period settled in Nanshijiao, a neighborhood in New Taipei City’s Zhonghe District. 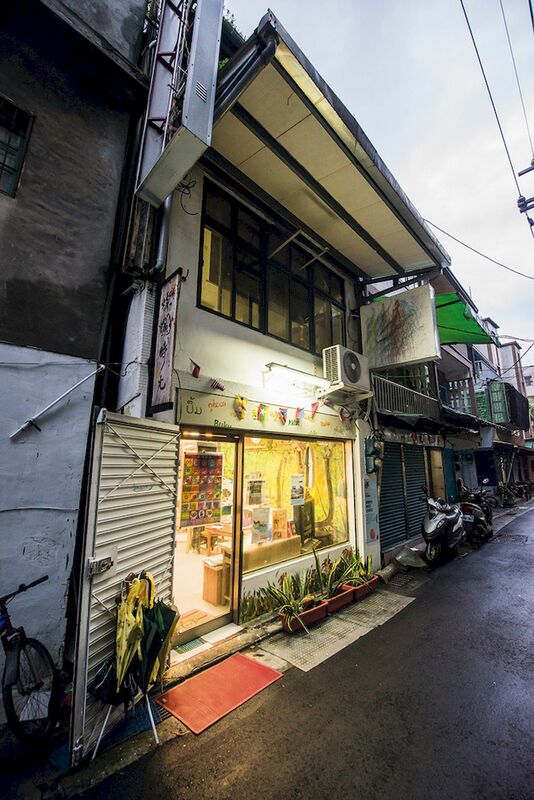 In April 2015, a new bookstore opened there in an old three-story walkup on a little lane just off Xingnan Road. The remodeled build- ing oozes an atmosphere of bookish refinement and handmade hominess. The store’s theme, moreover, ties in deeply with the neighborhood’s character. The proprietor is Chang Cheng, who previously launched 4-Way Voice (a series of monthly publications put out in multiple Southeast Asian languages), the television series Singing in Taiwan (in which immi- grant workers are invited to perform in their native tongues), the Bridge to Home project (in which mem- bers of the immigrant community visit their home countries in Southeast Asia), and the Taiwan Litera- ture Award for Migrants. But, why open a bookstore? 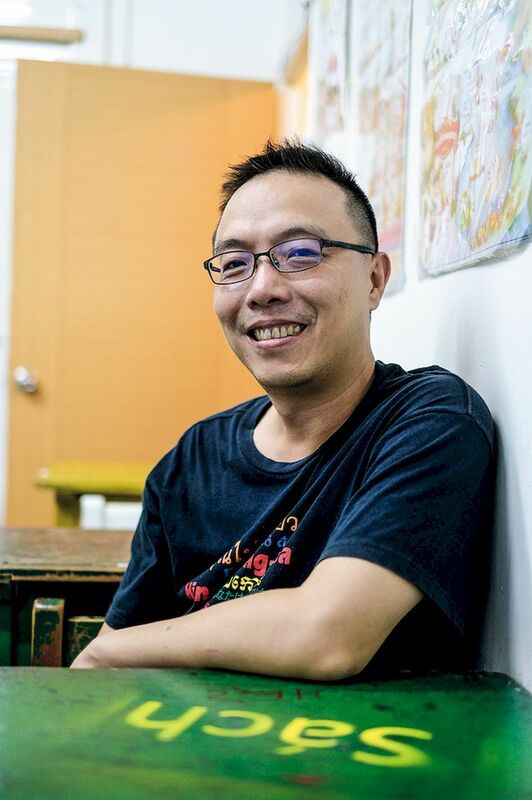 Chang Cheng, who has long taken a deep interest in issues relating to migrant labor- ers from Southeast Asia, recalls the sense of security and tranquility that he once enjoyed at bookstores in Vietnam when he went there to study the language. Chang has now returned to Taiwan, and while he doesn’t necessarily have a terribly good mastery of the various languages of Southeast Asia, he nevertheless deals with these languages day in and day out as part of his job. While working to organize the Taiwan Literature Award for Migrants, he met Erin Cipta, an Indonesian woman providing home care service in Tai- wan 365 days a year. The relentless work schedule made the home she worked in a virtual prison. 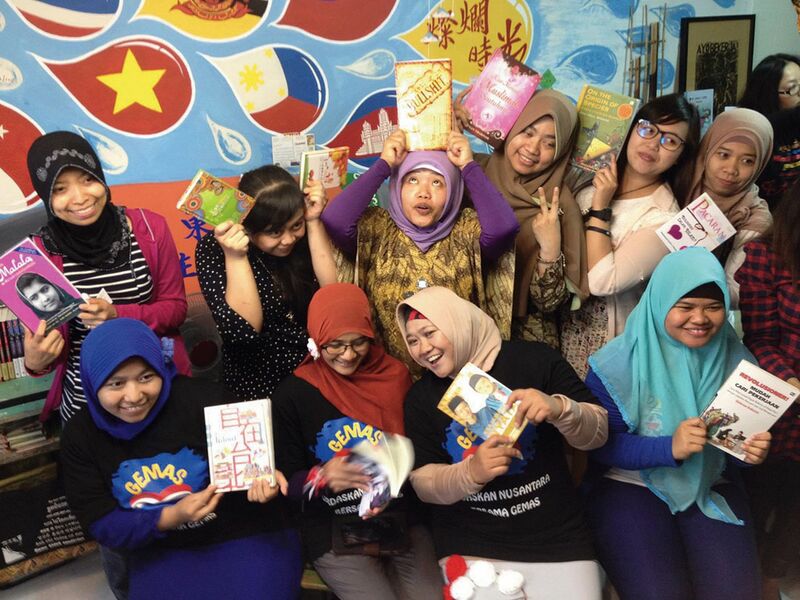 But Cipta said to Chang: “Reading makes me happy, writing makes me free.” The statement got him thinking about how to meet the need of Southeast-Asian migrant laborers for reading material. Chang decided to launch a bookmobile service. Later, however, friends running a regular bookstore persuaded him to open his own bookstore. He named his establish- ment Brilliant Time: Southeast-Asia-themed Bookstore. When the idea for opening a bookstore first occurred to him, says Chang with a chuckle, he turned to “Mr. Face- book” to post a request for help. Sure enough, the very next day a friend told him about a building for rent in Zhonghe. The building was a definite fixer-upper, but with help from volunteers and friends, Chang got Brilliant Time up and running. The first floor houses the actual bookstore. The wall on the right as you enter features a painting of a Southeast- Asian rainforest done by Chang’s mother, so that visitors can read in a pleasant atmosphere. The wall on the left, mean- while, is covered by a mural executed by a father–daughter team. The day of the store’s opening coincided with Thai- land’s water festival, so a blue wall features an image of an elephant snorting out water droplets that expand to form the flags of all the Southeast-Asian nations. This bookstore is also one of various venues for Taiwan’s Living Library activities, where noted people from all walks of life come to give talks. The second floor is home to a movie theater, and there are plans to use this space in the future as a performing arts venue. The third floor is set aside for classrooms, where language courses are taught; besides encouraging recent immigrants to teach their native tongues, such courses meet the gradually growing demand in Taiwan for instruc- tion in Southeast-Asian languages. Courses are currently being offered in Vietnamese, Indonesian, Burmese, Taga- log, and Thai. Some of the books at Brilliant Time are Chinese-lan- guage publications with a focus on Southeast Asia. Some have been brought back to Taiwan by “carriers” who vol- unteer for the job. 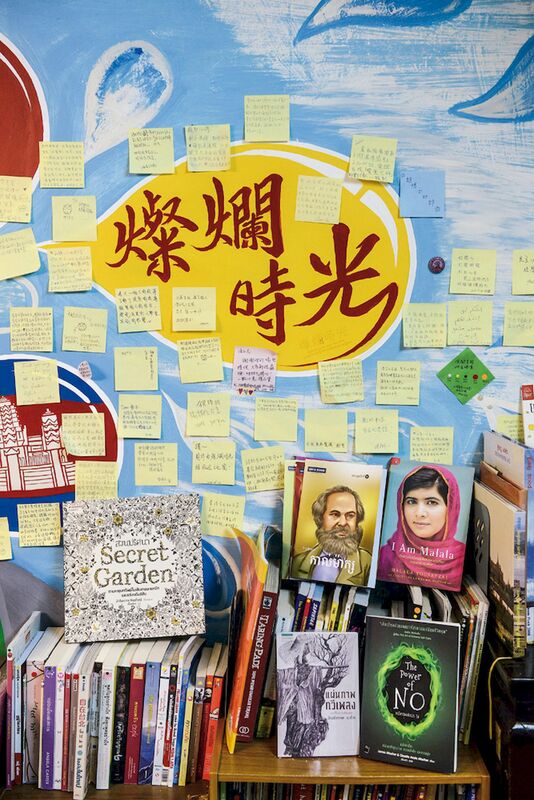 In early 2015, Chang launched the “take a book you can’t read back to Taiwan” book drive in order to stock his bookstore with reading material for immigrants and migrant laborers from Southeast Asia. Anyone at all—tour- ists, businesspeople, etc.—is welcome to bring back what- ever they can, be it new books or used. The book drive has elicited an enthusiastic response, as people keep coming by the bookstore to drop off books. 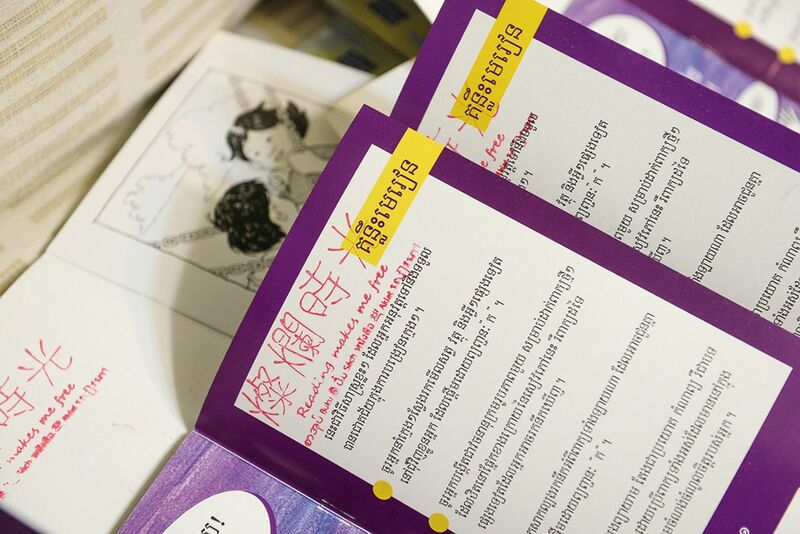 Included on the shelves, for example, are Vietnamese versions of the Japanese com- ics Doraemon and Detective Conan, a Thai version of When the Moon Forgot by Taiwan’s Jimmy Liao, and The Little Prince in Thai, Vietnamese, and Khmer. All of these were brought back to Taiwan by supportive volunteers hoping to get more reading materials to migrant workers here. the bookstore. For example, one international NGO sent a packet of books from Cambodia after learning from a visi- tor from Taiwan about the book drive. A sign at the counter of Brilliant Time books explains the store’s policy of only lending its books, rather than selling as most bookstores do. Unlike a library, there’s no return dead- line, and unlike book rental stores, customers get their entire deposit back when they return books. And, so that readers can trade thoughts and feel each other’s presence, Brilliant Time allows borrowers to make notes in the margins. It was Chang who thought up the policy of lending out books at the original purchase price, foregoing any return deadline, and refunding the customer’s entire deposit upon return of a book. Besides wanting to provide immigrants and migrant workers with low-cost access to books, Chang is also inter- ested in seeing that second-hand books are well used. He feels that books do not lose value the way other products do; the fact that a book has been read doesn’t reduce its value, and in fact the margin notes made by a reader may actually make it more valuable. He encourages everyone to make notes so that readers can share their insights, not unlike the way people interact on the Internet. And then, the system brings those same readers back into the bookstore for a visit. Curious passersby step into Brilliant Time for a look around, and likeminded people strike up conversa- tions. All sorts of wonderful resources make their way to the store from the nearby area. An officer from the National Immigration Agency re- cently came to the bookstore to find reading materials for migrant workers held at NIA detention centers. The of- ficer said that a detainee at a center had nothing to keep himself occupied, and was in a very anxious state of mind. He decided to take the detainee a copy of 4-Way Voice and found that the person’s spirits were lifted considerably. A volunteer at Brilliant Time posted about this experience on Facebook, sparking lots of discussion. 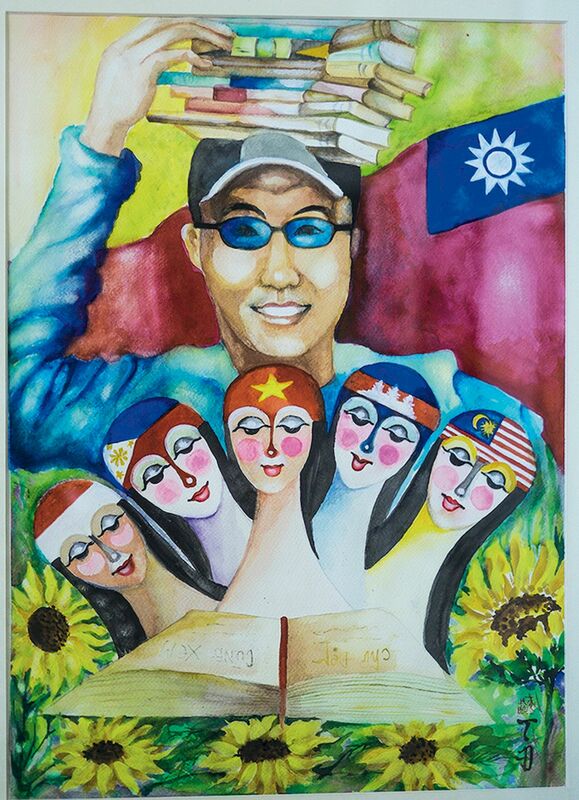 Someone suggested it would be a good thing “if they had Southeast-Asian read- ing materials at all of the NIA detention centers.” This idea found support within the NIA’s Southern Taiwan Affairs Corps. Hopefully books in Southeast-Asian languages will soon be available at all NIA detention centers. 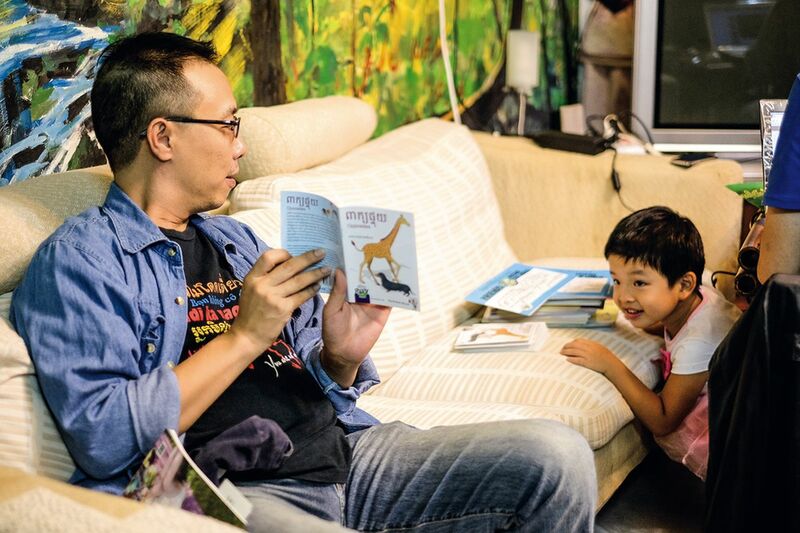 In addition to the Brilliant Time bookstore and the bookmobile service, Chang has also set up a “Southeast- Asian reading materials alliance” with smaller operations all around Taiwan in Taoyuan, Chiayi, Taichung, Dong- shi, Fengyuan, Hsinchu, and Yilan. Some of these alliance members operate out of locations such as a noodle shop, a lunchbox restaurant, or a hardware store. Quite clearly, a bookstore need not necessarily look like a typical bookstore. Some migrant workers from Indonesia, inspired by Chang’s establishment of Brilliant Time, organized Gerakan Masyarakat Sadar Baca dan Sastra (GEMAS, the “Indo- nesian reading culture promotion society”). The founders agreed that after their employment contracts in Taiwan came to term, each would return home to set up a commu- nity library and contribute to the spread of knowledge. Erin Cipta, who had previously returned to her native Indonesia after completing a two-year contract in Taiwan, came back this year to receive the Taiwan Literature Award for Migrants. 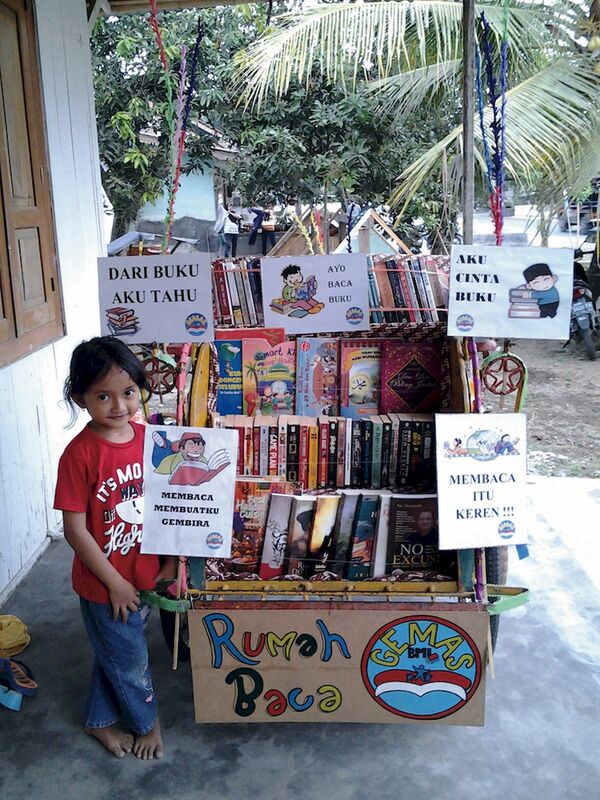 She took advantage of her trip to deliver a suitcase full of Indonesian reading materials to Brilliant Time. At the shop, the smiling Cipta enthusiastically told staff there all about the books she had brought, and re- ported that the community library she was working to establish in Indonesia had already opened to the public. Says Cipta: “They wouldn’t hire me at the local public library because I lacked the required academic qualifica- tions, so I decided to open a library of my own.” She raised donations of 60 boxes of books, and all of these now sit on shelves at her home. Friends are welcome to come and pe- ruse the reading material. 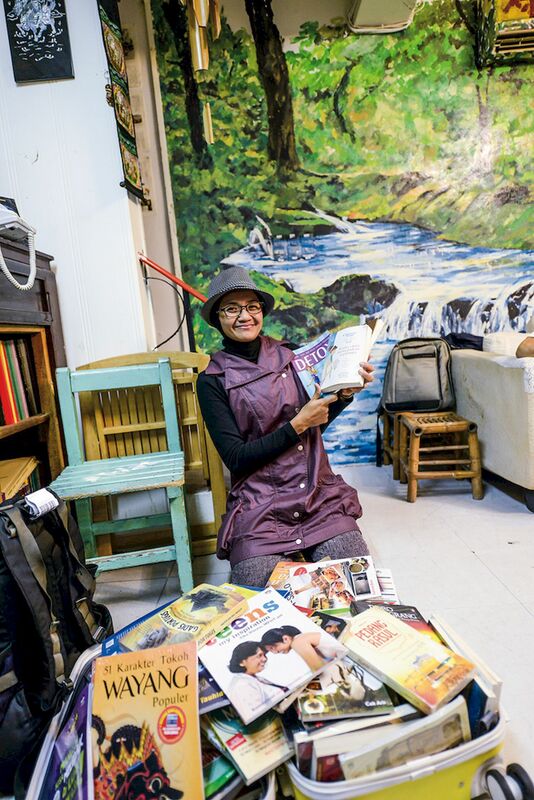 So far, fewer than a tenth of all visitors to Brilliant Books are people from Southeast Asia because most caregivers enjoy little time off work, and the bookstore is located far from any industrial zone and thus far from where many migrant workers are employed. Chang therefore hopes to get more localities covered by his Southeast-Asian reading materials alliance, so that more migrant workers can get access to reading materials in their own languages.